In the age of iPods and iTunes, vinyl records are making a serious comeback. While digital tracks are still the best sellers, vinyl sales reached a staggering 2.8 million in 2010. That’s 2.8 million units of vinyl making their way into the hands of collectors, DJs and regular music lovers who simply appreciate the unique vinyl sound. Record stores all over the world specialize in this re-emerging source of music, and we’ve rounded up a few of the best for you. Twenty years old this year and covering 6400 square feet, Waterloo Records is a fixture on the Austin music scene. Known for its knowledgeable staff and liberal return policies, Waterloo also host in-store performances by major artists and offers free beer while browsing. Additionally, its genre-free A to Z filing system means finding that used vinyl or new CD just got a lot easier. Founded in 1976 in Athens, Georgia, with a second location opened in Atlanta two years later, Wuxtry is the oldest record store in Georgia. Specializing in all types of music and consistently purchasing used vinyl has allowed Wuxtry to keep its content varied. Dedicated sales people, which included Peter Buck of REM, maintain the shop’s status as the best record store in town. Upstairs from the record shop is the sister store, Bizarro Wuxtry, which sells comic books, toys and a variety of other things. Three million records. That’s right. Three million records may just be the largest collection of vinyl in the world, and this south Florida mainstay has record junkies from all over the world as its loyal customers. With ceiling high shelves packed with albums, the 6,500 square foot warehouse showcases music from every genre, as long it’s on vinyl. The larger sister shop a mile away offers CDs, musical instruments, radios and other types of gear for sudiophiles. At just ten years old, Wah Wah has become a steady supplier of records for many of Europe’s top DJs. 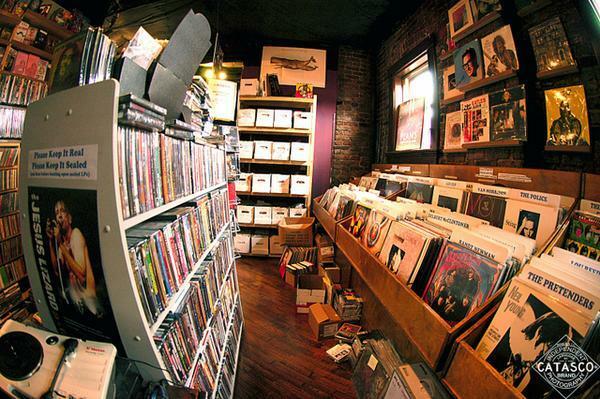 Not known for its ease of browsing, Wah Wah is packed to the rafters with every musical genre imaginable. Also offering CDs and books, this record shop in the trendy El Raval neighborhood is guaranteed to leave you lighter in the euros department. With artists such as The Beastie Boys and Henry Rollins gracing the guestbook, it’s no wonder this Melbourne institution is one of the city’s best record stores. Specializing in traditional rock and roll, Greville Records is a great place to find classic 1970’s and 1980’s releases. Books, concert posters and other paraphernalia round out the impressive collection that’s been over 30 years in the making. Named for a particularly mean cat, Red Cat Records is consistently recognized as one of Canada’s top music stores. The owners are former musicians and are happy to pass their extensive knowledge of music to their customers. Red Cat specializes in new indie releases, as well as a large collection of used, new and reissued vinyl all housed in a small yet hip red building. Hailed as the best independent record store in Paris, Groundzero is owned by music lovers who wanted a place to call their own. Primarily focusing on new and reissued indie, hip hop, funk and electronic genres, the two level shop has a cool living-room vibe, complete with listening stations and bookshelves. Locally designed T-shirts and carefully selected books and magazines round out the collection. Browsing through a record store can be close to zen for some. Finding that rare track, admiring the gorgeous album art, and simply meeting people with the same passion for music that you have can make hours spent browsing in a record store really enjoyable. Shopping for records? The missing ingredient on the Good2Go Travel Checklist. Making a point to stop into one of the music institutions and have a look is well worth the trouble. Also remember that record purchases fit very easily into any backpack!